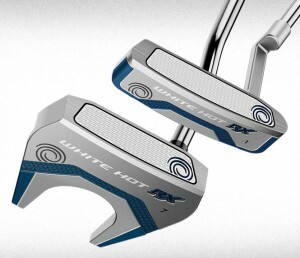 Callaway Golf has launched a new line of Odyssey White Hot RX putters that will be available Feb. 26. The putter brand also has introduced a line extension to its popular Odyssey Works line that will be available at retail on Feb. 5. In the new Odyssey White Hot RX Putters, Callaway says it has taken its White Hot feel, made it even better, and combined it with better roll to get the ball in to a “pure roll’’ faster to help golfers control their speed. The White Hot RX insert, according to Callaway, is coupled with a dual-layer injection molded insert with a softer core that leads to exceptional speed and feel. To promote even better roll, Callaway says the White Hot RX features the oval pattern design that was made popular in Odyssey’s Metal-X and Odyssey Works lines. The new elastomer insert, according to the company, features oval roll technology with a textured clear coat to increase friction and help get the ball rolling faster. The White Hot RX lineup includes the following head shapes: #1, #2, #7, #9, Rossie, 2-Ball V-Line, and the new V-Line Fang. The V-Line Fang combines the technologies and shaping of the Odyssey #7 model with the popular V-Line mallet for improved alignment and accuracy. These putters will be available in multiple grip options, and golfers can choose from Odyssey’s standard rubber or SuperStroke grip options to find the perfect setup for their stroke. The White Hot RX line starts at $159.99; $179.99 with Superstroke grips. Callaway says the new Odyssey Works line extensions include the Fusion RX insert and major-winning Versa alignment, along with some of Odyssey’s most innovative technologies and head shapes. The new Odyssey Works putters start at $179.99.